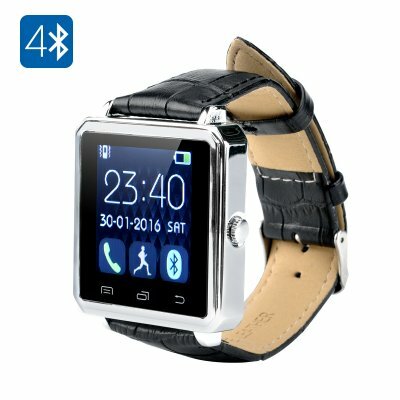 Successfully Added Bluetooth Smart Watch - 1.44 Inch Screen, Remote Notification, Calls, Pedometer, Sedentary Reminder, Sleep Monitor, Anti-Lost to your Shopping Cart. This Bluetooth smart watch is for more than just telling the time. It's the perfect accessory for your iOS or Android phone. With its Bluetooth connectivity it can relay all your notifications and calls direct to your wrist which is a lot easier than reaching for your phone each time it beeps. With all the features of a standard timepiece - accurate time and date – as well as the ability to sync to your iOS or Android device you can play music, answer calls, get Facebook, Twitter, email and other notifications and never need go rummaging through your bag or pockets for your phone. With pedometer, sleep monitor and sedentary reminder this watch will keep an eye on your health, tracking how many steps you take, ensuring you don't sit for too long in one place and letting you monitor how restful your sleep was. This is a great way to keep your fitness goals on track and ensures you can keep to those New Year’s resolutions of trimming the waistline and living a longer healthier life. The anti lost feature will alert you should the phone become unpaid with this smart watch so there’s no chance of you leaving your smart phone behind at the office of coffee shop. The 1.44 inch touch screen is makes it easy to view all incoming messages and when used with an Android device it this watch can be used as a remote trigger for your camera, great for fantastic selfies. This Touch screen Bluetooth Smart watch comes with a 12 months warranty, brought to you by the leader in electronic devices as well as wholesale Bluetooth Watches..